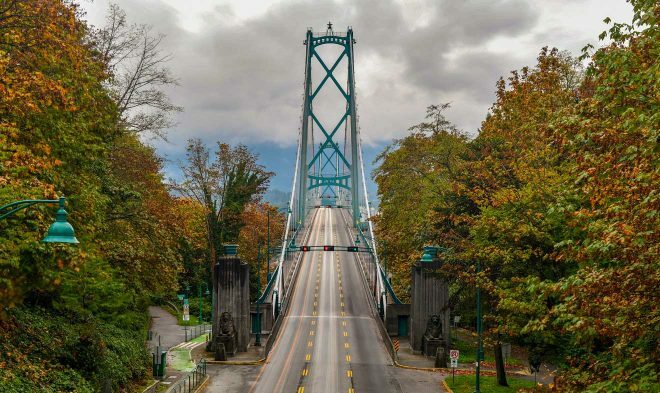 Deciding to visit Canada during a road trip and to rent a car can be one of the best ideas you will ever have and it will transform your vacation in a real adventure! 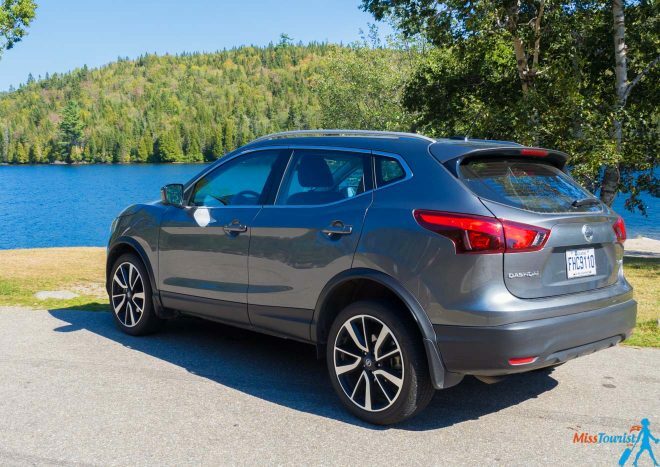 Why is it a great choice to rent a car in Canada? I personally enjoyed it because of the flexibility and freedom it gave me to organize my route, stop along the way whenever I wanted, take my time and admire the gorgeous landscapes at my own pace. Plus, there are many options out there for all budgets! 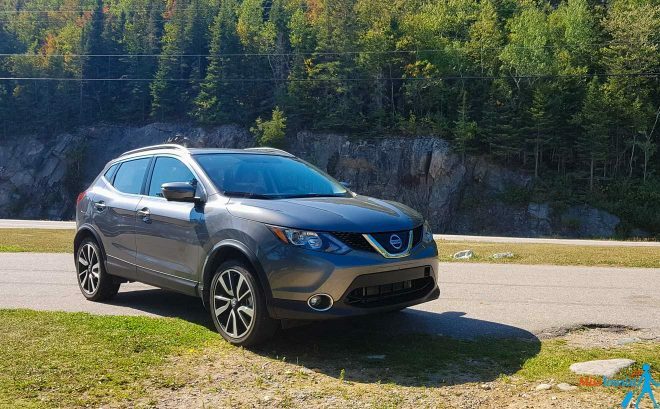 I did a 16-days road trip around Quebec and Ontario provinces, but the tips given here will be applicable for renting a car in the whole country. 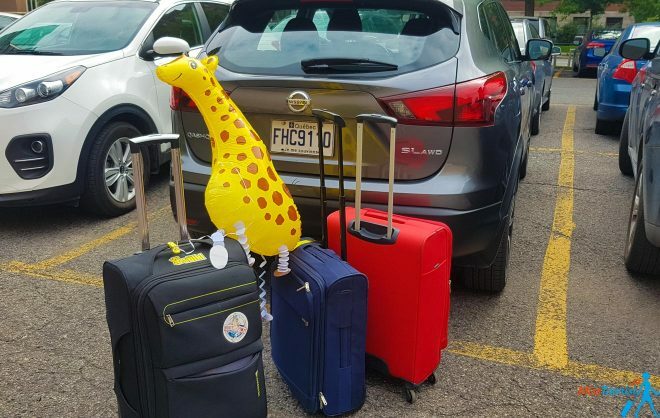 Read all information carefully – some of these car rental tips are specific to Canada and some of it you might know already if this is not your first time renting a car (in this case it will be a good reminder!). 3. Watch out for any possible additional fees! Let’s start from the most important part, shall we? As you may know, prices vary from company to company. One possible way of finding a deal is to compare rates individually for your specific dates on Budget, Avis, Dollar, Enterprise, Hertz, Thrifty, National, Alamo, Discount, Advantage Car and numerous others. Another option is to use a price comparison aggregator – for example, I used AutoEurope to find the best car for my trip! What is cool about AutoEurope and other aggregators like it is that they compare all the rates for the international and local companies that are available in the country for your dates so that you don’t need to spend your time manually comparing the options. Everything can be done in one click! There are also many filters, so you can sort out the results by your preferences – type, location, prices and many more. AutoEurope is basically a SkyScanner in the world of car rentals! So, what are the average prices you should expect to pay when renting a car in Canada? 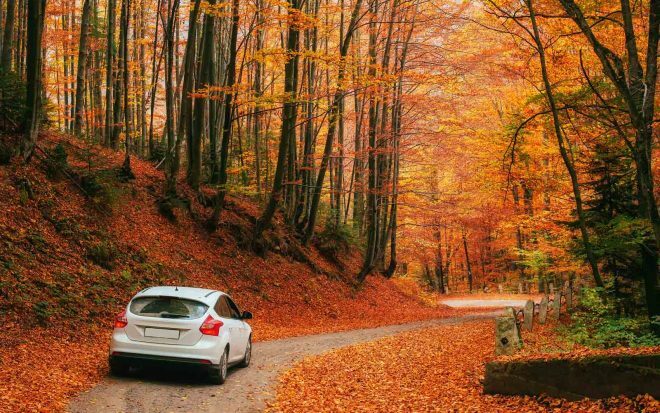 Remember that the price will highly depend on the type of car you choose and the season you are visiting in. All in all, as I said, it is always best to book as much in advance as possible! I have not heard about any cases of car hire in Canada being discounted closer to the date. You especially should not expect the price to drop if you are traveling in the high season – that is anywhere between May and September. The demand during these months is so high, the suppliers are not going to lower the prices, that’s for sure! When I searched for my dates – from Melbourne, return to the same city, from 12th of September at 9 AM to 24th of September at 17 PM (13 days) – the best combination of price and model we found was a WV Jetta or similar from Budget Car Hire. I really did not have any specific preferences and because that was the best price-model correlation, we went for it! As we booked quite late (only a couple of weeks before the trip), our total price for an economy car was 333 US$ (442 CAD). Now I see that if we would have booked the car 6 months in advance, the price would be 184 US$ (244 CAD), which is almost half the price! So learn from my mistakes and book in advance if possible! When we arrived at Budget Office, we were given a Nissan Qashqai instead of a WV Jetta, which was even better than we expected! 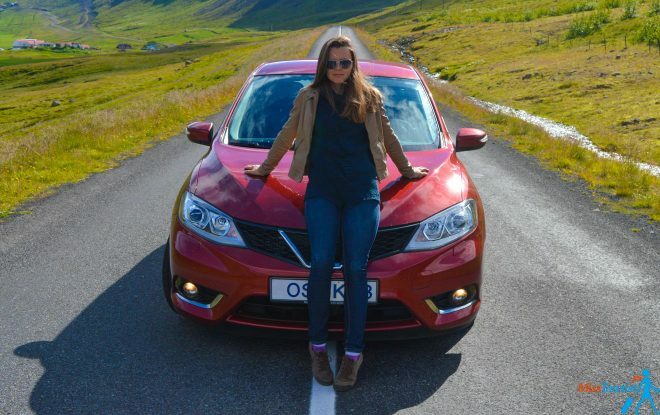 The car was perfect for the 2 of us – very spacious and new, so we could not be happier with it! ATTENTION: I paid the price requested by the rental office, but you can lower this price for about 3 times. How? Read point #8 below. (I did not know this trick when I rented the car myself; I only figured it out when I started doing a better research in order to write this post for you guys!). We took an insurance of 30 CAD a day plus taxes, which ended up to be 444 CAD for 13 days. By the way, this is more than the car price itself! Remember that a considerable part of your vacation budget will go on gasoline. 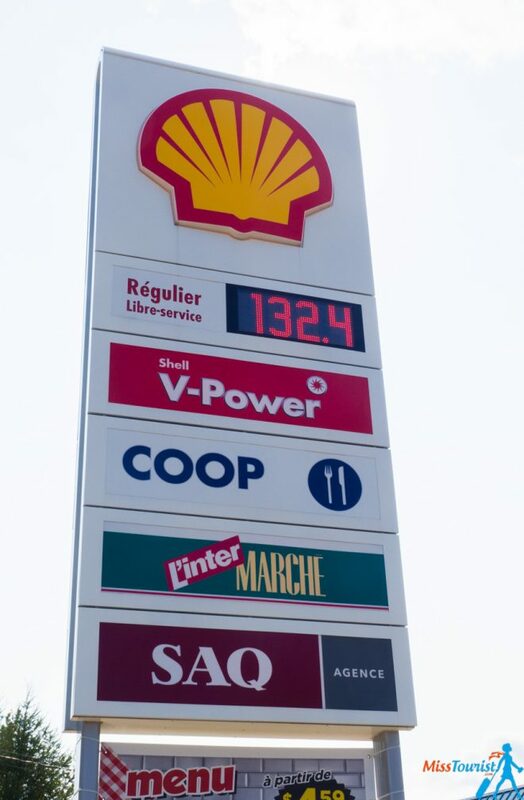 PRO TIP: Gas prices are generally higher in Canada than in the USA, but a bit cheaper than in Europe. 1l of gas (1/4 gallon) is currently 1,32 CAD. Please check the updated price here. My and my friend covered over 2400km and have spent a bit less than 300 CAD on gas during our 2-weeks road trip around Ontario and Quebec. NOTE: When renting a car, do not forget to return it with a full tank! If you don’t, you will have to reimburse for the gasoline and the prices in the rental office are muuuuch higher than in a gas station, trust me. Is your luggage going to fit? Think about how spacious the car is, how many people will be traveling with it, will all of you fit comfortably? Are you going to travel with kids? Do you need a special kid’s seat? Are you going to bring your own child seat (you can do this and there is usually no extra charge from airlines for the seat)? Does it have a GPS included? Our built-in GPS helped us a lot because sometimes there is no Internet connection on the road. You can also bring your own GPS from home if you want to. Is the car equipped with Spotify/other music options or is it radio only? The road is long, and even if radios were really good in Canada, you will still want to listen to something different at some point and with no ads. Does the car have cruise control? Most of the cars are equipped with it by now, but it never hurts to double check – we found it to be extremely useful when driving on Canadian highways! As for the car models available to rent in Canada, you can pretty much choose anything you want. There is something for all budgets – from small economy cars to large luxurious models or electric ones. Most of the cars I have seen offered as rentals were new or almost new. If you’d like more recommendations on which car to choose, check out Paragraph 4 below in this post. NOTE: Most cars in Canada have an automatic transmission and unleaded gas or diesel. ATTENTION: You should be at least 21 years old AND have at least 12 months of driving experience in order to rent a car as a tourist in Canada! You might be charged an additional “Young Renter Fee” if you are between 21 and 24 years old. Also, do not forget to check that your driving license is not expiring in the following 6 months. Are there any additional driver fees? How many people are going to be driving? Keep this to a minimum if possible because most companies charge per extra driver. Any one-way drop-off fees? Some car hire companies allow one-way car rentals with no additional charge, but not all cars might be available for it and you should double check if they charge extra beforehand. Is there a 21 to 25 years old fee? (Only applies to you if you are from 21 to 25 years old obviously). As I said earlier, this is a common practice in Canada, even if you have a spotless driving history! Is there a premium location fee (in airports, for example)? Most of the times airport rentals are more expensive as they need to pay airport fees for running their business there. If you are renting your car from AutoEurope, you can actually see the location of each available car rental (press “Show Location” on results page). We chose ours to be in the city center, right inside the Montreal railway station. This way we could discover the city on foot for the first couple of days and then grab the car and goooo! 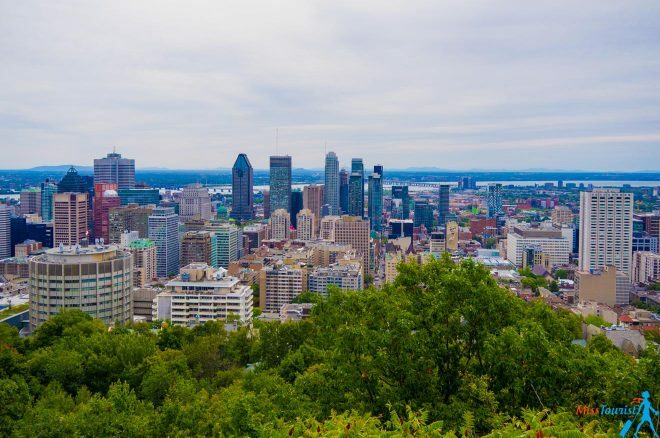 RELATED READ: Here is my post on 15 unmissable Things to do in Montreal if you are interested. 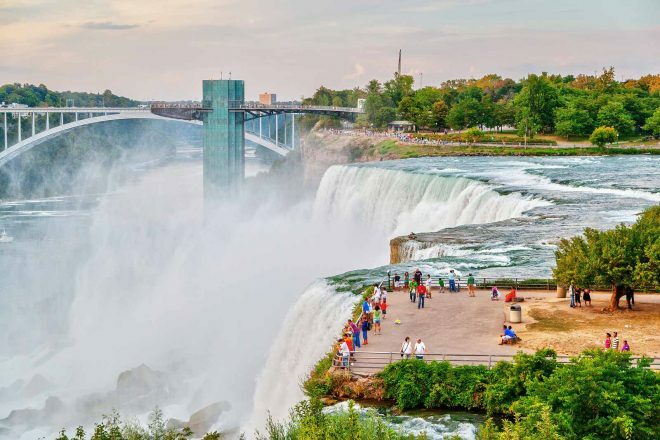 As I said earlier, Canada has everything to offer, so your choice will only be limited by your budget and will depend on the trip preferences that you have. RECOMMENDED CAR TYPE: A simple economy car would be your perfect solution. In fact, it is the most common option for road trips in Canada. 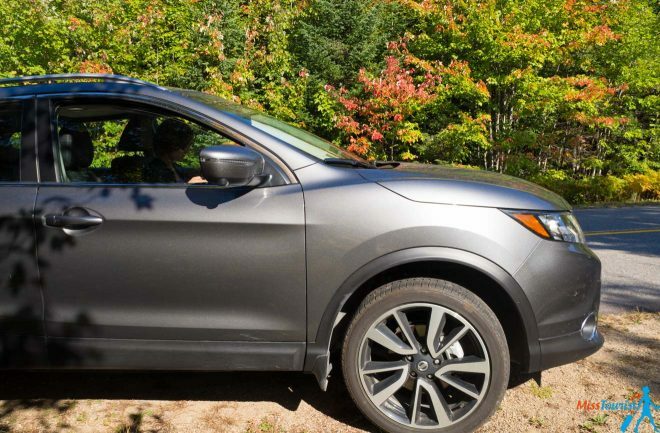 A normal economy car like VW Jetta or Nissan Qashqai would fit you perfectly if you need it to get from one city to another and go to National Parks. The road quality is outstanding in Canada, you won’t need more than that. In most cases, you won’t need this kind of car at all, as the roads conditions are perfect in almost any tourist location you might want to go to (including the Rockies, Banff, and other National Parks). If you are planning to drive the Northern Gravel Highway or many backcountry unpaved roads, I would recommend taking a 4WD. NOTE: Double check that the T&C for your car hire company in Canada actually allows you to go off-road. 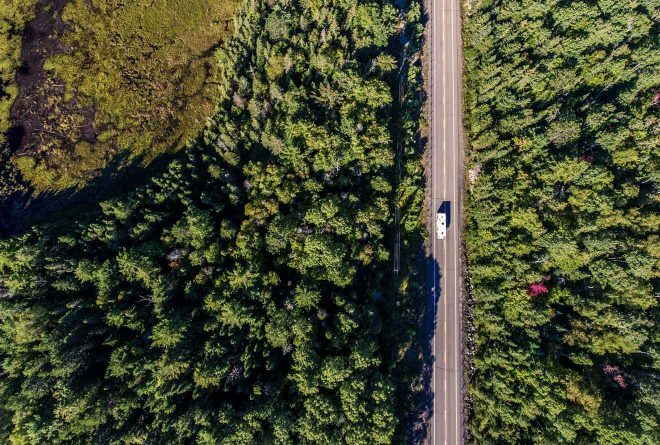 RECOMMENDED CAR TYPE: an RV (also known as a motorhome, caravan or campervan) – Canada is an ideal country for camper and RV (Recreational Vehicle) travel! With an RV you will be able to go anywhere and stay anywhere and you won’t need to pay for accommodation. Great option for adventurous travelers! NOTE: Don’t forget to check if the RV includes a kitchen too! 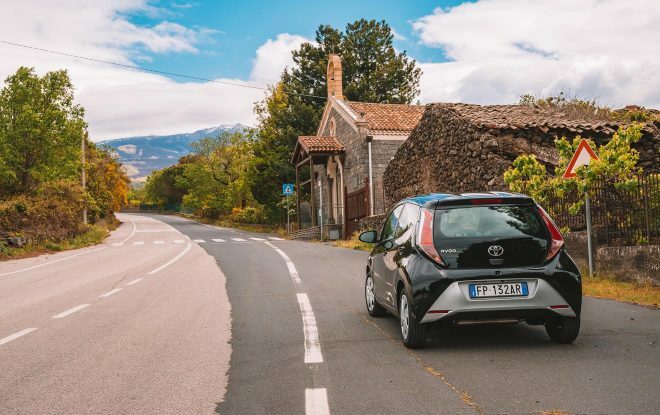 If you do not have much time to wander around and you are just searching for the cheapest car that will take you from point A to point B inside the city, then the cheapest, tiniest car will suffice. Remember – if you need some space for your luggage, this might not be the best option. So, the general suggestion would be to get a car that would satisfy your budget and comfort needs and would fit all the passengers with no problems. Try to choose a car that does not consume a lot of gas, as this will be a considerable extra cost for you. In most cases, a 4×4 is an unnecessary upsell, unless it is your personal preference to feel more comfortable. Your driving license. Make sure it is a) valid for the following 6 months b) in English or French. If your driving license is in another language, you will need to receive an International Driver’s Permit in your country beforehand. You will need a credit card to present at the car hire office so that they can freeze a certain amount of funds on your card – renting a car without a credit card in Canada is impossible. The name on the credit card and the driver’s name should be one and the same. If you pay at the end of the rental period, you can pay with any other card or even cash, but it is important that they deposit the money from the driver’s credit card. A child seat in case you are traveling with kids that are under 18 kg. Usually, your rental company can provide it for an additional charge, but if you refuse it, then you are obliged to have your own child seat with you. The insurance. All car rental companies supposedly have them for free, but you need to make sure you have it with you in case there is an accident. If there are any scratches – document them, take a picture of them and let the car hire assistant know about them. There is usually a special paper where he should mark all the possible scratches on the car. NOTE: Try to take a written confirmation AFTER you return the car where it states that the car has been checked and they confirm there were no damages made. I know that some car rental companies can charge you afterwards for some small damages that they did not see before (and that could not have been done by you). Unless a sign tells you not to, you may take a right turn facing a red light as long as you first come to a complete stop and wait until the way is clear. NOTE: This rule does not apply in Montreal, so you cannot turn right on a red light in that city. The road signs are pretty similar to the ones that are found all over the world, but beware that the ones in Quebec region might be in French. 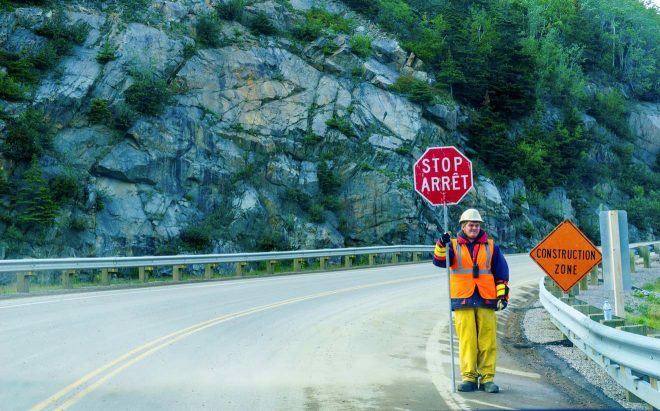 (“Arret” is “Stop”, for example). Everyone in the car must have a seat belt on. The use of mobile phones is forbidden for the driver unless he/she has a hands-free device. Any child between 22 – 40 lbs (10-18 kg) should be secured in a forward-facing child seat. NOTE: While you can find some gas stations working 24/7 on big highways, the majority of petrol stations are open from 8 AM to 10 PM. The speed is measured in km/h and you drive on the right side. 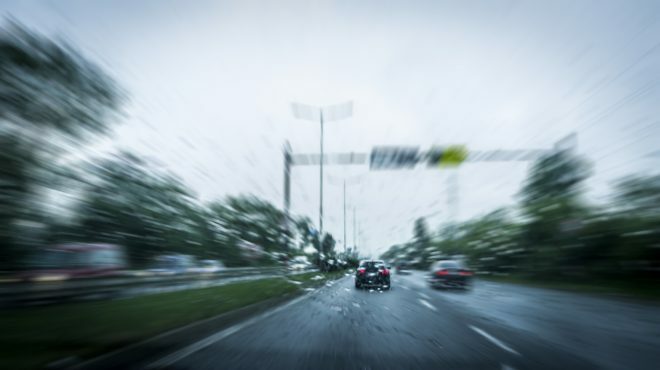 Here are the general speed limits (which can vary insignificantly) – in most cities the limit is 50 km/h, 80 km/h for 2-lane highways and 90-100 km/h for major highways. Don’t go off-road – most insurance companies will not cover the damage if you drive on a non-asphalt road. That is a violation of the agreement, so they will have a full right not to pay you. If there are 2 or more people in the car, you can use a special lane for HOV (High Occupancy Vehicles). It was recently introduced in some provinces on some of the highways and it may be marked with diamonds. It is a great time saver as this lane is usually less crowded! If you can, try to bring your rented car back during the office working hours opposed to just dropping it off in a designated place. This way an agent can inspect the car in your presence and confirm there are no damages before you leave. If you can’t bring it back during the rental’s office open hours, I recommend taking photos of the car’s condition again (so one time before you take it and one time before you return it) to prove that you did not damage the vehicle in case there will be any problems. If you do damage your car, get an independent quote before you return it. This way you will get a fair idea on what the fare bill might be. You have the right to request a proof to see where the car was repaired and how big was the cost. As I mentioned earlier, I recommend saving some cash and renting a car only after you explore a city by foot. Why? Because in cities like Toronto the traffic is crazy and parking is a nightmare, especially for a person not familiar with how it is organized. If you, like me, have a road trip to do, I suggest renting a car after you are done with the first city and using it as a mode of transportation between cities and other points of interests. When you are IN the city, I recommend leaving the car at a parking lot and enjoying the attractions by foot. Having said that, you will still drive in Canadian cities at least a little bit. Are there any precautions you should take? First of all, pay attention to bicyclists on the street, there are quite many in Toronto and especially in Montreal. While I don’t know if there are any speed cameras on highways, there are some in the cities. The speed limits inside the cities is 60-70 km/h (37-44 mph). As I noticed, drivers are quite accurate and calm in Canada. They don’t try to cut your way and are generally very polite. Parking can be a little bit confusing at first – read all the signs, it usually says when you can park. When you find a free spot, make sure to find the closest parking meter where you will need to type in your car number and the parking spot number (there will be a little pole with the number on it usually) and pay for the number of hours your car will stay there (cards are usually accepted too). 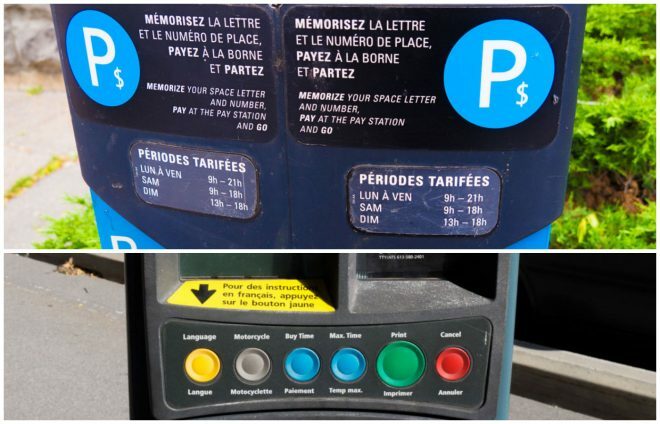 If you need more details about parking in the cities of Canada, make sure to ask me in the comments and I will reply! 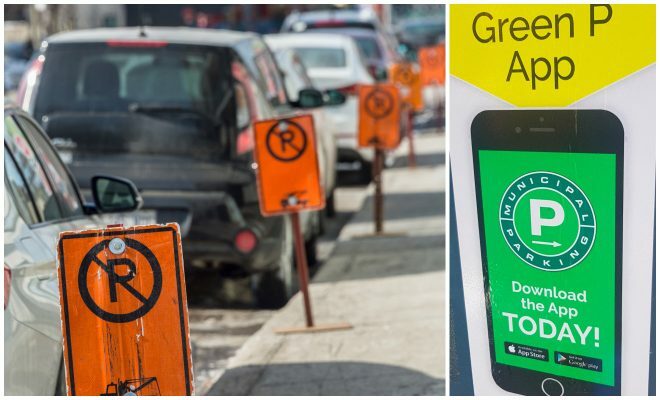 PRO TIP: Try to park under a green “P” sign – this indicates municipal parking and it is usually the best option price-wise. 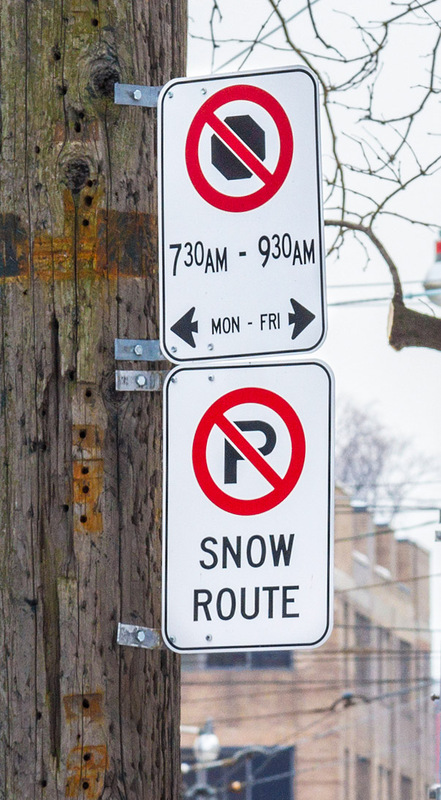 If you are completely lost with parking, check out Parkopedia.ca – it gives you the exact conditions and prices sorted by the closest location to you. 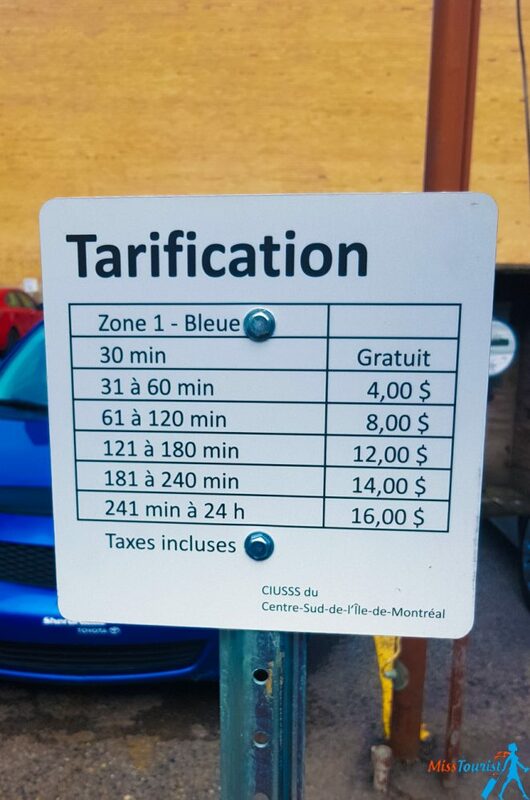 PRO TIP 2: Check if your hotel accommodation has the parking included because paying 15 CAD per day on top of the price of the car rental is a significant extra cost. Most highways have a 90-100 km/h speed limit and a local told me that if you exceed it by 10-15 km it is fine, but over that, you will surely get a fine. 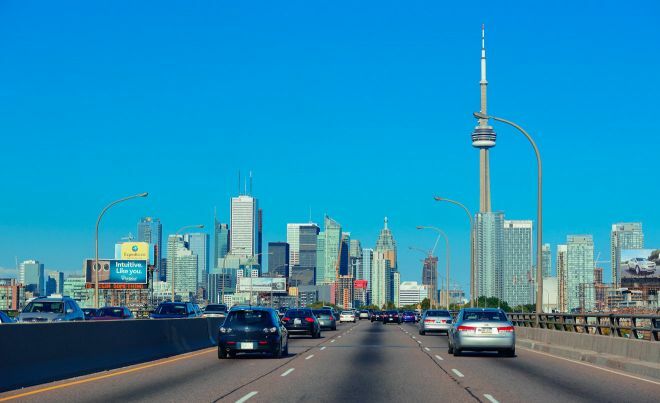 When driving on highways in Canada, don’t forget to use your cruise control – it is going to be very useful as the roads are straight and of good quality. 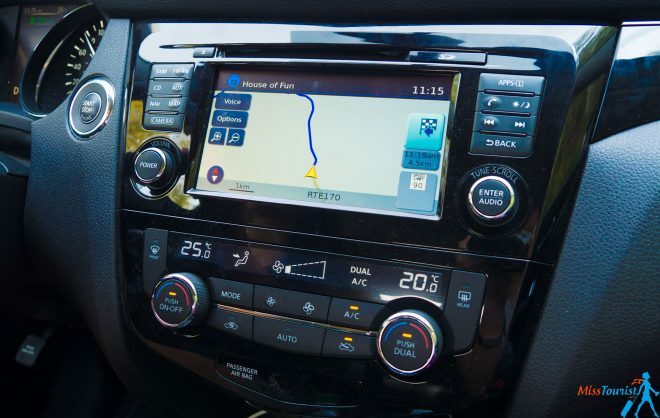 A built-in navigator will be very useful as well. If you know that you are going to use your phone a lot for GPS or for Instagram stories, for example, make sure you have a USB charger in the car, as it will be very useful when driving long distances. One more important thing about the highways – please beware of animals, I have seen many small dead animals on the road! Remember – where there is one animal that you can see, there are probably more that you can’t. You can expect to see big animals such as bears and moose in Nova Scotia, British Columbia, and Alberta. Pay attention to the road signs, they usually indicate where you might be more likely to encounter an animal on the road. As for me, I have only seen a couple of really pretty birds and some rabbits on the road while traveling in Ontario and Quebec. Drinking alcohol, even a little bit, is not allowed in Canada and it can result with the suspension of your driving license, arrest or even a denied entry to the country in the future. An interesting fact shared with me by an Uber driver – technically, the road police is not allowed to stop you if you did not do anything wrong (because you could sue them later for your wasted time). But they will certainly stop you if they notice any strange behavior in your driving style. So, why not take a taxi if you decide to go out and drink? I think this will be the safest option for everyone and it does not matter in which country you are, to be honest. 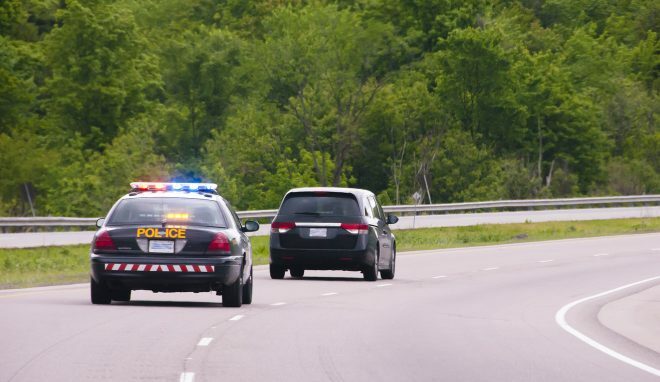 Even if it is very rare to be stopped by the road police in Canada (I only saw one road officer during my 2-weeks road trip), it is always better to double check that you have all your documents beforehand. The international license is not required in Canada, just make sure your driving license is in English or in French, otherwise, you will need to apply for the International driving license when you are in your home country. We only saw the road police once during our 2 weeks trip but that, of course, does not mean we did not follow the rules. As a general rule, the prices for gasoline in big cities are lower than in small towns. Also, be aware that some stations in small towns might close at 6 PM. The gas stations are encountered pretty often in between cities or National Parks on the road, but I would recommend fueling up in advance if you know you will be going to remote areas. 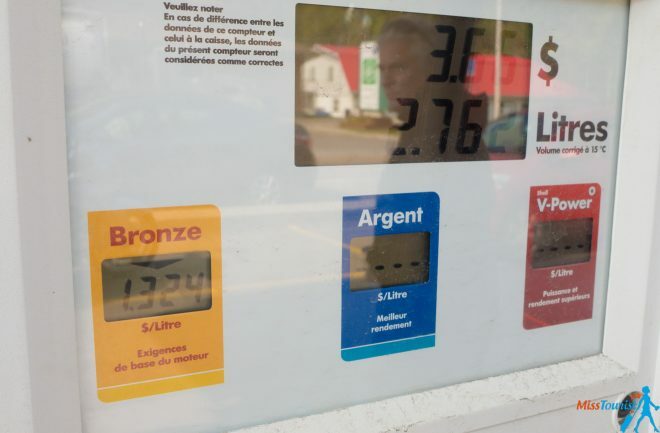 In Quebec: Choose the amount in Canadian dollars -> then insert the pump in the car -> choose the type of gasoline (bronze, silver or golden) -> wait until the fueling up is finished -> go to the cash register to pay. 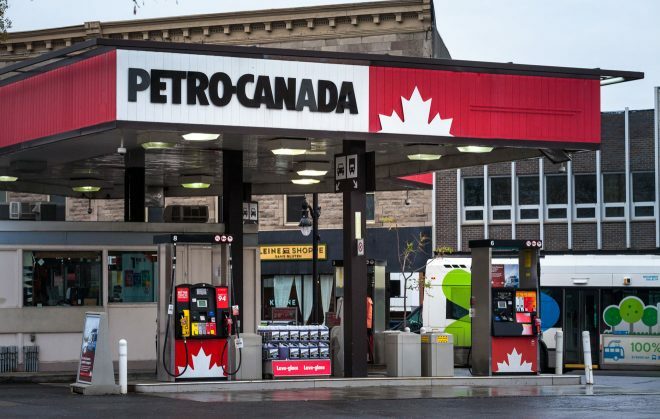 In Ontario and probably all other provinces in Canada: insert the pump -> choose the type of gas -> choose the amount of money you want to pay (not the number of liters) -> insert your card and pay. You can also ask for assistance if someone is around. Most of the times there will be someone to help you out in any way. There is a 407 Electronic Toll Road in Ontario (it was on our way, but we just took a 401 instead). 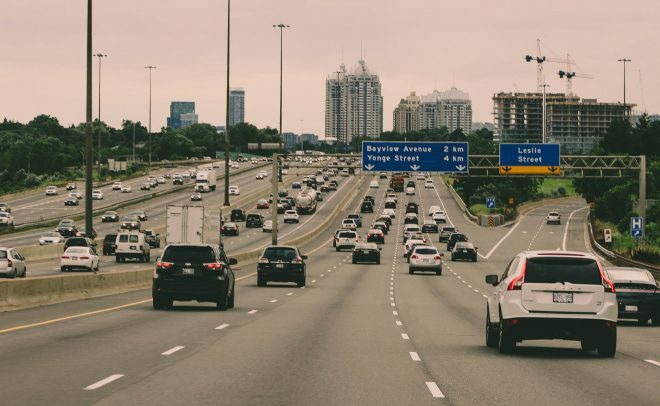 Beware that there are no payment kiosks on 407 – an automatic system will scan the license plate of your car and send the bill to your car rental company later, which means that your credit card will be charged afterward as well. A basic insurance called Collision Damage Waiver (CDW) is almost always included in your car rental contract. What is a CDW? If an accident happens, the CDW will only cover a small part of the damage and you will need to pay the bigger part of it yourself. As I mentioned earlier, in my case the price was 30 CAD per day + taxes, which ended up to be 444 CAD for 13 days. Check if your personal vehicle insurance covers rentals. Some do and that would save you over 400 CAD in 2 weeks. You can also check if your credit card covers oversea car insurance (you can call the bank directly if you are not sure). PRO TIP: Please note that this hack only works for residents of the USA. Bonzah is a third-party insurance provider that has MUCH better rates than the car hire company directly – about 8 US$ a day on average instead of 30 CAD that we paid per day. NOTE: Make sure to buy it BEFORE you start driving, otherwise it will not work. I hope this information will be useful for you, as my fast calculation shows that we would’ve been able to save a least 200-250 US$ if we would use this one instead of the rip-off rates offered by the rental office. 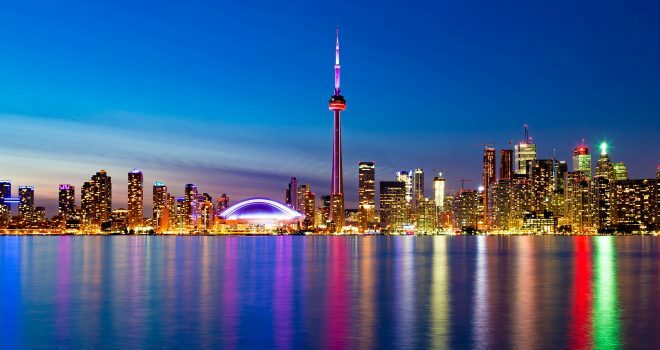 The best time to visit Canada is anywhere from July to mid-September. This period is great because all the activities are open this time of the year and the weather is warm. But this is also the highest season, so prices are the highest too. If you are not keen on going during the high season, then the last 2 weeks of May and the entire month of September will be nice too, although you might be unlucky with the weather. I traveled at the end of September and, though the weather was generally nice to us, we had a couple of days when it was absolutely freezing. 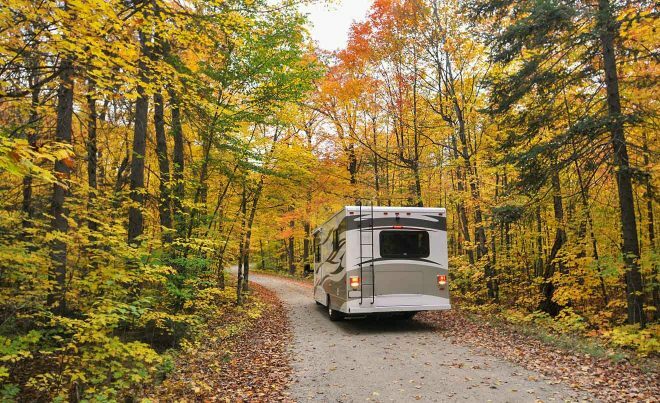 NOTE: If you want to travel by RV, I don’t think you should do it anywhere between November and April, as it will be too cold. The weather conditions might be brutal (heavy snow, ice roads etc), so do not underestimate this. 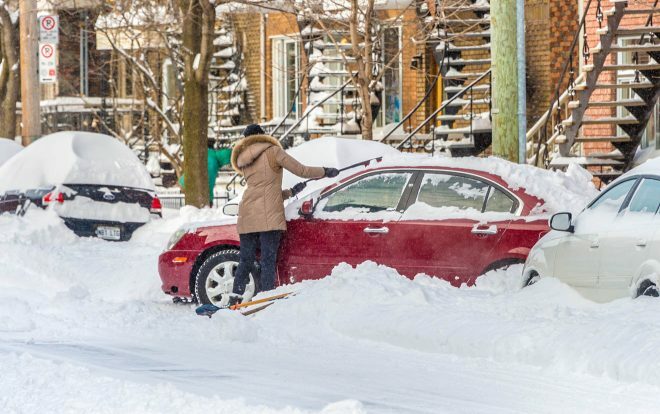 ATTENTION: If you are driving in Canada during the winter period, please make sure to request winter tires because just because it is winter, this does not mean the car will come with them. They usually provide cars with the summer tires by default (don’t ask me why). Check the weather forecast before going to your destination to make sure this is a decision based on experience. I do not want to scare you or anything, but it would be smart to charge your phone before going on the road and make sure you have warm clothes, a blanket and some food with you – just in case. 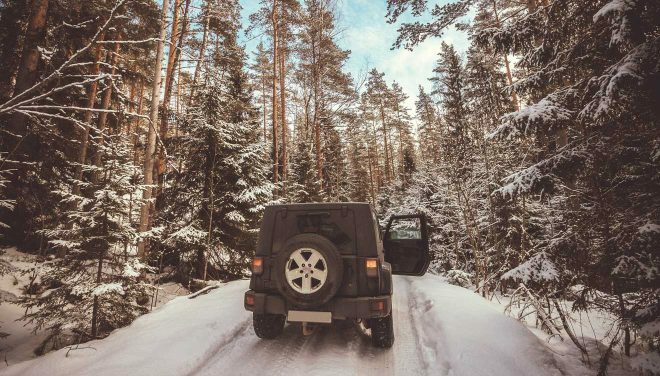 Depending on where you are going (just between some big cities or close to the North Pole) you will need a different type of car or a different type of tires (such as snow or tire chains for mountain areas). As I mentioned earlier, double check in advance that your car rental provider has winter tires on the car. While you can rent your car right at the airport or right about anywhere in the big cities, I, of course, recommend doing it online beforehand – not only you will have wider options, but the rates will also be significantly lower if you book online! 1. Go on AutoEurope using this link. 2. When you access the website, you will see a screen where you can select the pick-up location, drop-off location and the date and time for each of them. You can choose a specific location or all the locations in a city (in this example Toronto), in which case you will get a longer list of options where you can pick up your car. Remember that picking up and/or dropping off your car at an airport will mean a bigger price. 3. After you entered your locations, dates and times, click on “Find your car”. 4. Then you will see a list of types of cars (economy, compact, 4WD etc) and all the rental companies that are available for your specific search, as well as their prices. In the upper left corner, you can see how many cars are available for you in total at the moment (in this example there are 78 cars). 5. You can click on “Go to Map View” in case you want to see all the available cars in their specific pick-up locations. Then you can filter your results by transmission type, coverage options (basic or inclusive), rental company or location type (airport or city). 6. Now you have to select the type of car you need from your preferred rental company. In this example, I chose an economy car from “Budget” for $144 CAD. 7. After choosing your car type, you will see all the car model options you have. In this example, I only have 2 options: Chevrolet Spark with Basic rate and with Inclusive rate. Choose your preferred rate and then click on “Show locations”. 8. A drop-down map with all the available locations will appear. You will first have to select your pick-up location from the list. The rate will appear. 9. Then select the drop-off location. Then click the yellow “Select” button. 10. 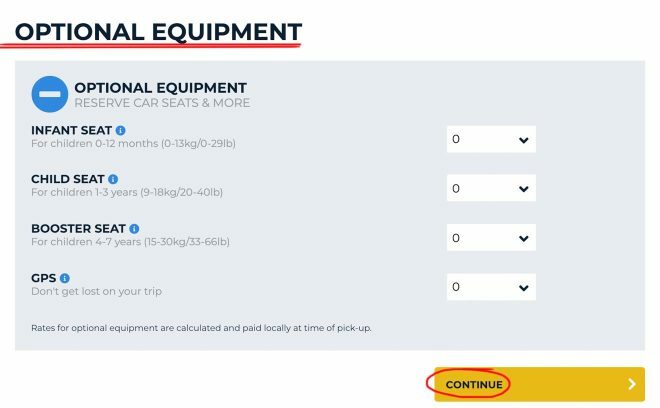 Now you can select the optional equipment you may need – infant seat, child seat, GPS etc. Select what you need and click “Continue”. 11. Insert your driver information (on the right you have your reservation information in case you want to modify anything). 12. Then scroll down and complete your Payment information. 13. 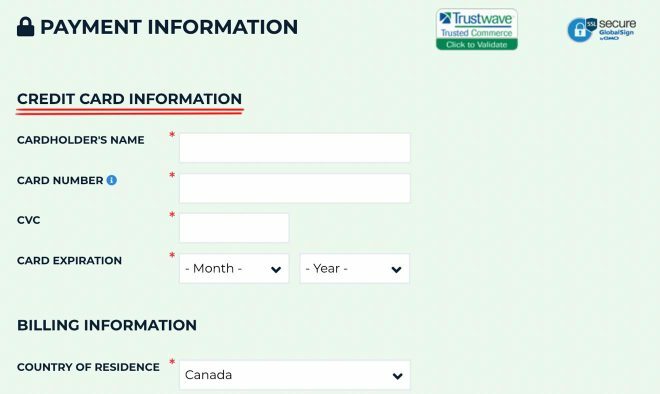 On the right side, you have all the Important information such as all the taxes, fees, and details, driver requirements, fuel policy etc. Read them carefully. 14. Click on the yellow “Submit Payment” button. 15. That’s it, your car rental is booked and confirmed! 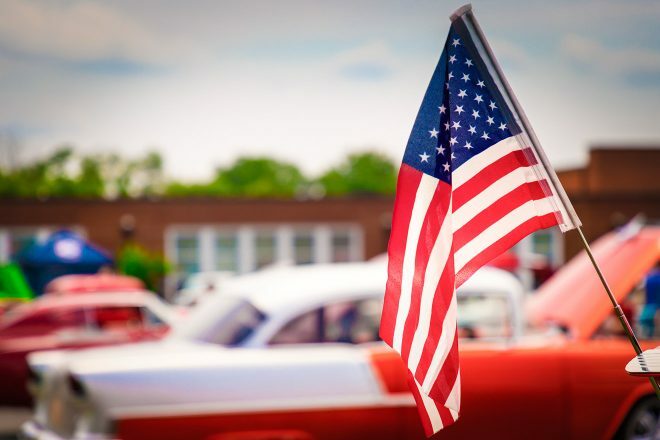 Sometimes the car prices are significantly cheaper in the USA, so renting it in the USA might be a good option especially if you were planning to combine the 2 countries on a trip in any way. Example: If you are going to Vancouver, it might be worth checking out car rentals in Seattle and then driving an extra 2.5 hours between the cities. Most major car rentals will let you rent a car in the USA (it does not matter if you are a US citizen, you just need a visa in case you are not). The only disadvantage is that if you are not a US citizen, you will spend some extra time at the border control being asked about the purpose of your trip to Canada etc. Do not forget to let your car hire company know you are going to do the cross border travel though, as they need to know this in order to arrange a Canadian Non-Resident Insurance Card for insurance purposes. PRO TIP: Make sure to save your receipts for the goods you purchased in Canada! You will be able to claim a refund on your way back to the USA. As I said above, a one-way rental is possible, though not easy and not cheap in most cases. So you should call the office in advance to double check this! Before we conclude, I would like to talk a bit about some alternative means of transportation in the country. Except for a simple car rental, you could also try checking out the so-called Fly-Drive packages. A Fly-Drive includes a plane ticket AND a car rental right away. I did not know anything about it before my trip, otherwise, I might have used it. So far, I have found packages like this from the UK here, here and here. If you are from these countries, please check it out, it might be a good deal for you! Even though there are trains and buses in the country, they will only get you as far as from one city/town to another – you will not be able to get to National Parks or any other slightly remote areas. My friend wanted to go to Mont Tremblant (back then I hadn’t arrived in Canada yet and she did not have the rented car), so she had to change 3 buses to get there and the owner of the hotel she was staying in looked at her like she was crazy. In short: it is possible, but not very comfortable and definitely time-consuming. Plus, I am sure you would enjoy going at your own pace and stopping for a picture whenever you like rather than traveling in a big bus full of people, right? 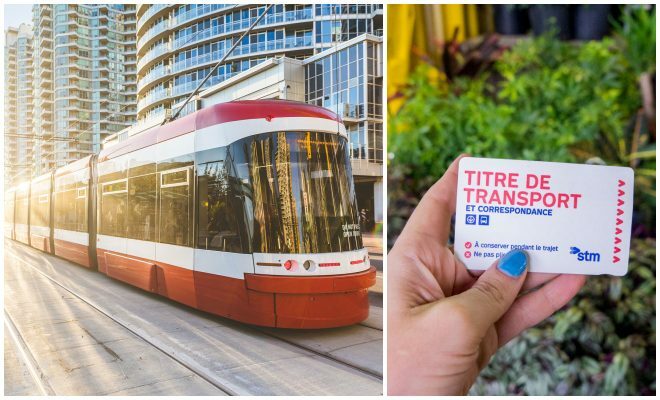 If anything, I would take the train – I know that Trans-Canadian routes are very good. In fact, I would love to come back again one day and do that trip too! But firstly, it is much more expensive than a car (about 4.000 US$ for 8 nights per person) and secondly, it only has a specific route, so you would be far from flexible with it. 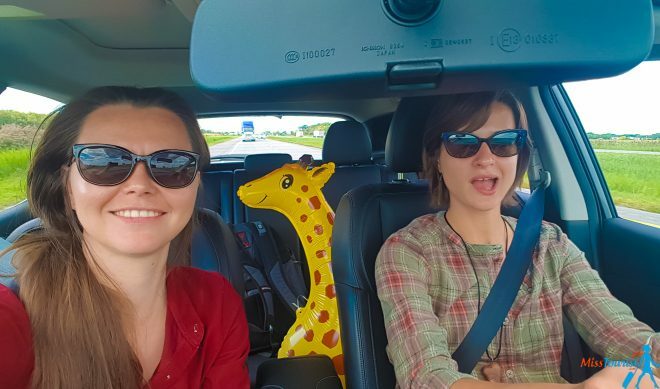 Meet our mascot giraffe Gosha, he drove around Canada with us! 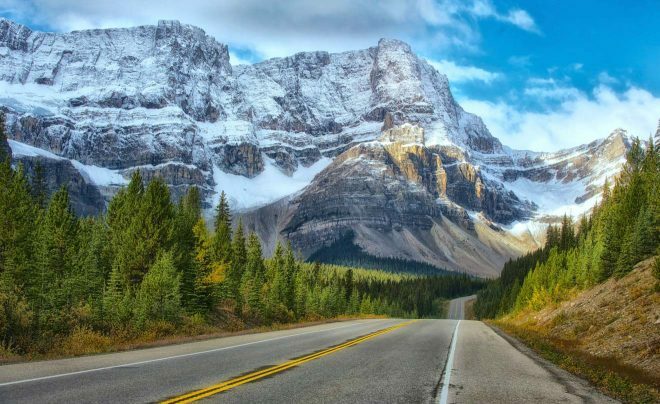 Beautiful and vast, Canada is any road tripper’s dream – it can offer terrific scenery, great quality highways, and an overall unforgettable adventure! Even if you are better off using public transportation and walking in cities, there is no way to enjoy this spectacular destination without a car, especially if you are going to visit some remote areas (any National Parks, smaller cities etc.) And, overall, it is much faster and much more comfortable to have your own means of transportation and to travel at your own pace! I hope my tips about things to consider when renting a car in Canada were useful for you, I tried to cover everything from prices to car models and rules on the road. As usual, I love chatting with my readers, so be sure to drop me a line in the comments if you have any questions, or just stay in touch on Instagram where I post my travel updates! 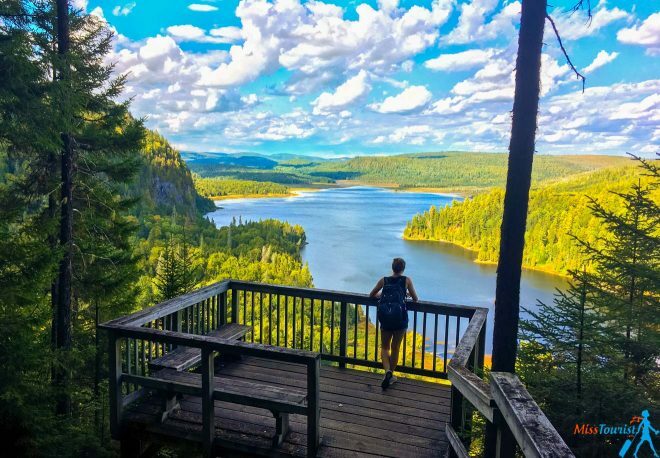 2 Weeks Road Trip Exploring Quebec and Ontario Provinces – With Prices! Excellent article. I am actually going to Montreal this autumn and would need to rent a car for a month, so all these tips would be very handy. I want to add to your #5 – take pictures of the car before you accept it. It doesn’t take long but might help in case a car rental company decide to dispute a condition of the car when you return it. It helped me in South America when a company tried to charge me some extra. Yes, indeed, it is a good tip! I usually take pictures of the car just in case too!